The essays in this collection, spanning 1925 to 1970, confirm Aurel Kolnai's place as one of the great conservative theorists of the twentieth century. Kolnai carefully analyzes the leading intellectual positions and thinkers of his day, the dominant social movements, and the prevailing moral influences—psychoanalysis, fascism, and National Socialism. 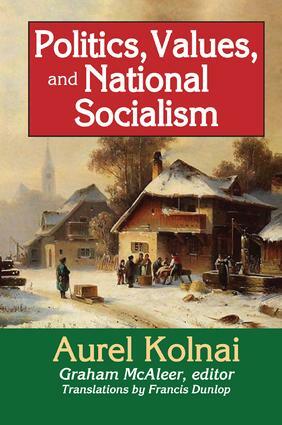 He documents how they run counter to the architecture of civilization.Kolnai is relatively unknown outside philosophical circles, but Politics, Values, and National Socialism provides an overview of his moral philosophy. In most moral philosophy books one finds pages devoted to the major theories of ethics. This volume is different. It seeks to address the larger moral question of what kind of thought works against morality, and by implication, how one can defend morality.Eager to protect the surviving islands of Liberal Civilization, Kolnai's concern is really one of theory. He shows that much of what passes for moral theory is subversive of moral order. All who think that totalitarianism is a permanent threat, and who suspect that ideas can quickly be dangerously distorted in times of social unrest, will find plenty of clarifying ideas in this volume.